Fantasy becomes reality and authenticity waivers…..mind-boggling in the literal sense! 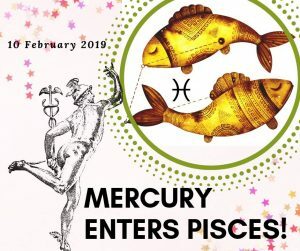 Mercury isn’t at his best in Pisces, he’s actually in his detriment and fall which obviously doesn’t help him feel good, or on the ball either for that matter. Mercury here tunes in his antenna, he’s the receiver of the word and thought but he has some difficulty in articulating his actual speech and sentences often come out confused and of dubious or multiple meaning. In other words; confusion reigns! This is due to the fact that being on the receiving end means he’s churning out whatever psychic stream he happens to be tuned into in any given moment. Often this makes him rather an attention seeker other times he’s silent and meditative especially when this psychic flow gets interrupted for some reason. During this transit however, he’s also an excellent listener and he really seems to be pay attention to what you’re saying…whether he’s actually taking it in or not is another thing altogether! Another plus side of this transit is that the rich internal scenario that is formed through the psychic connections can also be expressed in art or whatever other type of creative endeavour you might want to put yourself to…it’s an excellent time to communicate through visual or written expressions. This is how to really get your meaning over to others. The best moments to get the most out of Mercury’s sojourn here is to heed the last thoughts of the day as you drift into sleep or those that emerge from the subconscious upon waking.